ETC 1224B is an electrical interface between a North American 12 Volt commercial towing vehicle and a 24 Volt European trailer. ETC 1224B provides 6 independent circuits capable of supplying a total power of 800 Watts at 24 Volts. 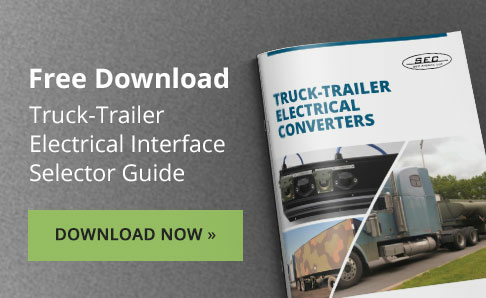 This power application to the trailer ABS system and its various lighting circuits is achieved through the same trailer connector pins conventionally designated for their respective functions. The interface’s compatible connectivity translates into no requirement for hard wiring and effortless installation. ETC 1224B is compact and lightweight at only 15 pounds. ETC 1224B has a flat profile making mounting practical to either the towing vehicle chassis or the front face of the trailer.